I’m going to talk about the four month sleep regression in particular here. But, as a sleep consultant, I hear the term “regression” used with regard to just about every imaginable circumstance. Essentially, if baby doesn’t sleep well for a couple of nights, the ‘R’ word starts to creep in. Some people subscribe to the idea that there’s an eight month regression, a 9 month regression, a 1 year regression. As well as teething regressions, growth spurt regressions, and so on. Others see these as simple hiccups caused by extenuating circumstances. But the four month sleep regression, everybody agrees on, and for good reason. It’s the real deal, and it’s permanent. And “four month sleep regression” is possibly the most uttered phrase by mums in those early months. To understand what’s happening to your baby during the four month sleep regression, you need to know a few facts about sleep. So here’s the science-y part, told in plain English. Many of us just think of sleep as an on-or-off situation. You’re either asleep or you’re not. But sleep actually has a number of different stages. These stages make up the “sleep cycle,” which we go through several times a night. Stage 1 is that initial stage we’re all familiar with where you can just feel yourself drifting off, but don’t really feel like you’ve fallen asleep. Stage 2, which is considered the first “true sleep” stage. This is where people tend to realise, once woken up, that they actually were sleeping. For anyone taking a “power nap,” this is as deep as you want to go, or else you’re going to wake up groggy. Stage 3 is deep and regenerative. Also known as “slow wave” sleep. This is where the body starts repairing the immune system, muscles tissue, energy stores, and growth and development. Stage 4 is REM (rapid eye movement) sleep. This is where the brain starts to kick in and consolidates information and memories from the day before. It’s also the stage where we do most of our dreaming. Once we’ve gone through all of the stages, we either wake up or come close, then start over again until the alarm sounds. So what does this have to do with the dreaded four month sleep regression we were talking about originally? Well, newborn babies only have 2 stages of sleep; stage 3, or deep sleep, and REM. They spend about half their sleep in each stage. At around the third or fourth month, there is a reorganisation of sleep. Babies embrace the 4-stage method of sleep that they’ll continue to follow for the rest of their lives. When this change takes place, baby moves from 50% REM sleep to 25% in order to make room for those first two stages. So although REM sleep is light, it’s not as light as these 2 new stages that they’re getting used to. With more time spent in lighter sleep, there’s more of a chance that baby’s going to wake up. That’s not to say that we want to prevent or avoid baby waking up. Waking up is absolutely natural, and we continue to wake up three, four, five times a night into adulthood and even more in old age. As adults, however, we’re able to identify certain comforting truths that baby might not be privy to. Anyways, now that baby’s suddenly realised that Mummy’s not around, and they’re not entirely sure where they’ve gone, the natural response is to do a little freaking out. That stimulates the fight-or-flight response and, next thing you know, baby’s not going back to sleep without a significant amount of reassurance that everything is OK. The other major contributor to this 4 month sleep regression, I find, is that up until this point, parents have either been putting their baby to sleep with a dummy, or by rocking them, or by feeding them, or some similar technique where baby is helped along on the road to falling asleep. Now that baby’s spending more time in light sleep, and therefore has a higher probability of waking up, this suddenly becomes a much bigger issue. Hence, the four month sleep regression. These sleep props or sleep associations can be very sneaky indeed. Because although they may be helpful in getting your little one to that initial nodding off stage, the lack of them when they wake up means that baby’s not able to get back to sleep again without some outside help. Cue the fight-or-flight, the crying, and the adrenaline. When this starts happening every half an hour, parents can find themselves in a nightmarish situation. 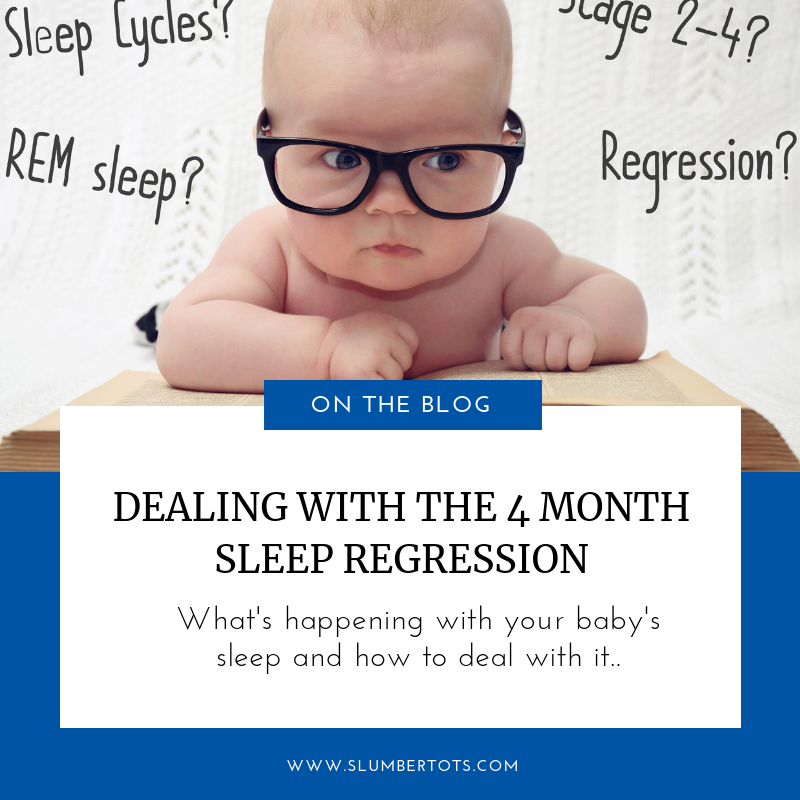 So, the good news for anyone experiencing the dreaded Four Month Sleep Regression is that it’s not, in fact, a regression at all. A regression is defined as “reversion to an earlier mental or behavioural level,” and that’s actually the opposite of what your baby is experiencing. What can you do to help your little one adjust? First off, get all of that light out of baby’s room. You might think that baby’s room is dark enough, or that baby mightn’t like the dark, and that it’s comforting to have a little bit of light seeping in. Baby’s room should be dark. I mean coal mine on a moonless night kind of dark. Tape bin bags over the windows if you have to, or cover them with tin foil (in the short term). Newborns and infants are not afraid of the dark. They are, however, responsive to light. Light tells their brains that it’s time for activity and alertness, and the brain secretes hormones accordingly. So we want to keep that nursery absolutely pitch black during naps and bedtime. Bedtime routines are also an essential component to getting your baby sleeping well. Try to keep the routine to about 4 or 5 steps, and don’t end it with a feed. Otherwise, you risk baby nodding off at the breast or the bottle. This will create the dreaded “association” we talked about earlier. So try to keep the feed near the beginning of the routine and plan the songs, stories, and getting into PJs towards the end. The whole process should be about 30 minutes long, and baby should go into their cot while they’re still awake. If you’re noticing baby getting fussy before bedtime, you’ve probably waited too long. Four month old babies should only be going about two hours between snoozes, and bedtime should be between 6.30 – 7.30pm. Now, there are going to be regressions, actual regressions, later on in your little one’s youth. Travelling, illness, teething, all of these things can cause your little one to have a few bad nights in a row. But when it comes to the four month “progression,” I’m happy to report that this is a one-time thing. Once you’re through this, your baby will have moved into the sleep cycle that they’ll essentially be following forever. And by taking this opportunity to teach them the skills they need to string those sleep cycles together, independently, prop-free, without any need for nursing, rocking, or dummies, you’ll have given them a gift that they’ll enjoy for the rest of their young lives. Of course, some kids are going to take to this process like a fish to water, and some will be a little more resistant. If yours falls into the former category, count yourself lucky, and go ahead and gloat about it on Facebook. For those of you in the latter camp, I’m happy to help in any way I can. Just email me or book a call and we can work on a more personalised plan for your little one. I offer a free 15 minute evaluation so I can get to know the specifics about your little one’s situation. If you’re experiencing issues with the four month sleep regression, or rather progression, book a call now. We can move forward as soon as you’re ready to get your little one sleeping through the night! You can also download my FREE guide, Five steps to a better night’s sleep for more tips to help with your little one’s sleep.